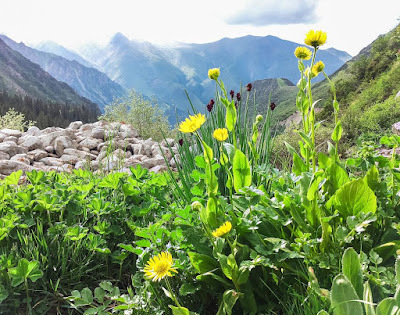 Kyrgyzstan, a country located where the old silk routes once ran through the heart of Eurasia, celebrates Christian, Muslim, Soviet and pagan holidays. Its superstitions are equally numerous and diverse. In fact, it is no exaggeration to say that Kyrgyz culture is a cradle for superstitions. People pass them from generation to generation to explain things that mostly defy explanation. Here are a few that stick out. When parents welcome their new-born child into the world, they try to keep the baby away from strangers for 40 days. It is believed that if a stranger — or even a non-member of the family — sees a baby, the child may get severely ill. This explains why women in Kyrgyzstan often drape cloth over their prams when walking their newborns, just in case alien eyes are peeping over their shoulders. Or, perhaps it's just an excuse for a party. 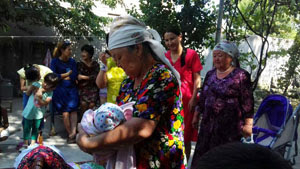 After 40 days, relatives, neighbours and friends come around to watch the family give the child a warm bath using 40 spoons of water and enjoy forty roundels of bread (mai tokoch) baked specially for the gathering. This is when the baby is first placed in a beshik, or traditionally carved cot, usually given to the baby by his or her maternal grandmother. Other baby-linked superstitions are more left field. 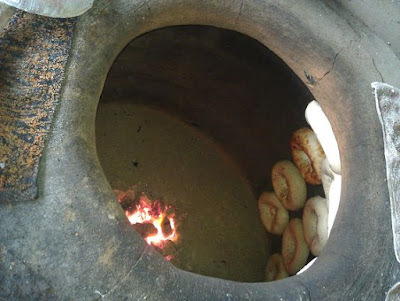 If a baby sleeps during the day but not at night, for instance, a mother may stick its head into a tandyr (a traditional oven dug into the ground to bake bread) three times in the hope that the baby gets used to the new day-night cycle. Photo taken during beshik toy or ‘crib party'. Image: Elita Bakirova and Erlan Bakirov. This takes place, of course, when the oven has not been heated up to bake bread. An alternative to oven-dunking is placing soot on the baby's forehead. Mothers tend to do that when guests come around to see the baby, so that the guests focus on the black spot, rather than looking directly into the newborn's eyes, which some believe can contribute to a child’s sleeping disorder. If a family is facing financial or personal difficulties such as disease, unemployment or depression, Kyrgyz families often burn parts of a pine tree (ysyryk) in a dish and move it around each family member, uttering words such as "May prosperity and success attend us throughout the year!" A similar rite is carried out over the newborn's beshik to drive away negative spirits. From a scientific point of view, pine, which is indigenous to Kyrgyzstan, can provide benefits in terms of respiratory health and the immune system. Whether that is also the case when it is burned is not clear. 3. Don't whistle at home, otherwise you'll be bankrupt! Many people find whistling an annoyance, including people that are partial to whistling themselves. But in Kyrgyzstan, as with many other parts of the former Soviet Union, it goes much further than that. In many homes, there is an iron-clad belief that whistling brings on bankruptcy. The roots of the superstition are unknown, but a Russian website offers two explanations. One is that whistling is the way in which “impure spirits communicate” and that echoing their language brings them into the home. The other is that ancient peoples used whistles as a way to summon a gust of wind if they needed it. But even then they had to be very careful with winds/whistling, as a strong storm might take the roof off their home. 4. Wave money at a full moon. Well, because why not? This is another superstition fairly prevalent across the ex-Soviet Union. A full moon is associated with abundance by some astrologists, so it doesn't do any harm to wave a banknote at it. No actual guarantee that your finances will wax, rather than wane, but it seems worth a shot. 5. Horseshoes in the land of horses! 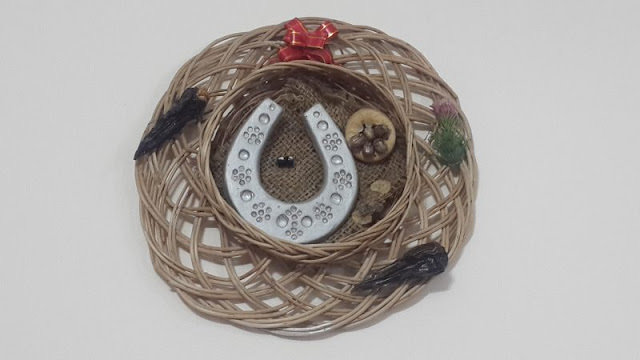 As in Western countries, Kyrgyz households have come to view the horseshoe as a good luck symbol, and have started to hang them outside their doors in recent years. This makes sense, since Kyrgyz owe a large part of their identity to horses. This article by Elita Bakirova and Erlan Bakirov originally appeared on Global Voices on 15 February 2017. It is re-published with permission. Horseshoe hung on the door of a beauty parlour in Osh, Kyrgyzstan. Image: Elita Bakirova and Erlan Bakirov.